Vision Needs for Children - Richard H. Marcus Optometry - ALAMEDA EYECARE OPTOMETRY RICHARD H. MARCUS O.D. "I love to work with kids. I love to teach," says Dr. Richard Marcus. 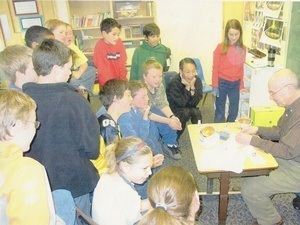 Dr. Marcus has been involved in the Alameda school community for many years, teaching children about their eyes. Dr. Marcus recommends children get their eyes checked starting at age 3 to detect vision problems that can affect their learning and school performance. Our office has a great colorful selection of kids' frames, We hope to see you soon! Enjoy your summer with your kids, have a great vacation. It is important to have your kids eyes checked before school starts.